The Village at Cedar Hill Achieves Deficiency-Free Survey! On February 2, 2016, Surveyors from the State of Vermont Division of Licensing and Protection, Department of Disabilities, Aging, Independent Living were at the Village at Cedar Hill to perform their annual survey of their Assisted Living and Memory Care Assisted Living Center. After a detailed examination of the Village’s policies, procedures, and processes they received a “Deficiency-Free” survey. Last October, the Nursing Home, Cedar Hill Health Care, also achieved a “Deficiency-Free” survey, Cedar Hill’s fourth in four years. It is rare accomplishment, and is an outstanding achievement for the facility and staff that are committed to a standard of excellence. The VTDLP is responsible for ensuring assisted living communities and nursing homes comply with mandatory state regulations. The inspections, called surveys, are conducted on a no-notice basis and consist of a checklist of areas and categories to examine. The categories include medication administration, resident care plans, medical records, kitchen sanitation, staff competencies, dietary needs and the overall safety of the community. Inspectors toured the community and reviewed staffing levels and training, HIPPA and residents rights notifications, charts for accuracy, quality of care and timeliness. They also review TB and immunizations records, documentation of falls, hospital notifications and emergency procedures. “This was a great achievement by our staff because in 2015 the Village had expanded from 21 apartments to a 42 assisted living apartments and added a 20-unit memory care. The Village also had to incorporate and add many new staff and positions” says Patricia Horn, Community Administrator at Cedar Hill. The entire staff contributes, including management, nurses, caregivers, housekeepers, dining room servers, culinary staff and maintenance. 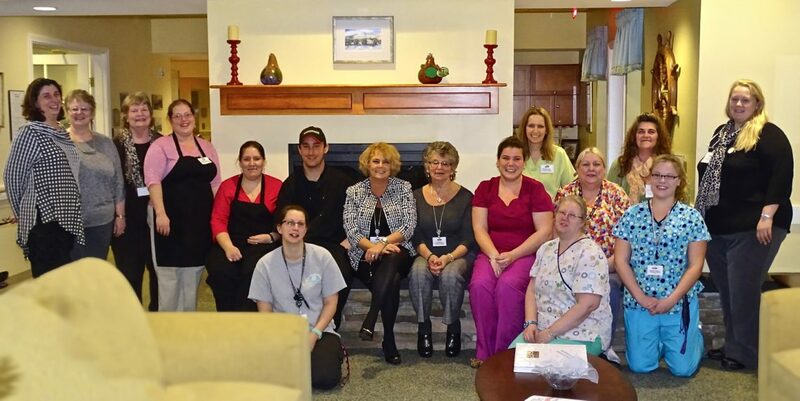 This honor is the most recent in a series of outstanding accomplishments by Cedar Hill that includes a five star rating from the Centers for Medicare and Medicaid Services (CMS); 5 Stars “Best Nursing Home” in Vermont by U.S. News and World Report; The American Health Care Association’s National Quality Bronze Award; multiple awards for team members at the 2015 Vermont Health Care Association Conference – for Mary Louise Sayles, Lifetime Achievement Award; Barbara Flinn, Nursing Home Activity Director of the Year, and Jon Manning, Nursing Home Volunteer of the Year; Department of Disabilities, Aging, Independent Living Quality Incentive Award; and a 2016 Best of Assisted Living Award Winner on SeniorAdvisor.com.